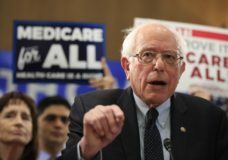 SAN FRANCISCO — Supporters of Bernie Sanders expressed outrage in the hours leading up to Tuesday’s primary elections, upset that The Associated Press and several television networks had already declared rival Hillary Clinton the party’s presumptive nominee. SAN JUAN, Puerto Rico — Hillary Clinton overwhelmed Bernie Sanders in Puerto Rico’s Democratic presidential primary on Sunday, putting her within striking distance of capturing her party’s nomination. WASHINGTON — Democratic front-runner Hillary Clinton and presumptive Republican nominee Donald Trump each won primaries in Washington state Tuesday. WASHINGTON — Hillary Clinton is closing in fast on the Democratic presidential nomination. After losing three of four state contests in May, Clinton has maintained a lead over Bernie Sanders of 271 pledged delegates won in primaries and caucuses. WASHINGTON — The awkward embrace between Bernie Sanders and the Democratic Party may be nearing a breaking point. WASHINGTON | Bitterness over the Democratic nominating process trailed Hillary Clinton and Bernie Sanders on Wednesday as they headed into the final stretch of their protracted battle to represent the party in November’s White House election. WASHINGTON — In Wisconsin, Democrats went with the candidate who excited them the most, and Republicans chose the candidate who wasn’t Donald Trump.